You might recognize Angelo Bariani from local farmer’s markets, standing behind a small table, lined with bottles of different sizes and labels of varying colors. His smile is irresistible and his broken English endearing. But the olive oil! It sweeps you off your feet. 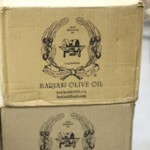 Bariani olive oil is not “just oil.” It’s a Slow Foodie’s dream. It’s local. It’s minimally processed using traditional methods. It’s raw. It’s high in antioxidants. It is a registered organic product. The business is consciously environmentally friendly. They use the whole olive. It’s made and sold by family members, who genuinely care about a high-quality product. Me? I care about all of that, I do. But to me, flavor is king. A company can do all the right things but if their product doesn’t taste good, forget it. Bariani oil isn’t just good – it’s amazing. 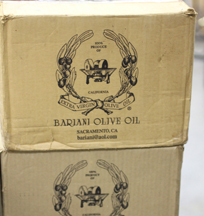 The Sacramento-based Bariani family makes olive oils, balsamic vinegar, and white-truffle oil. Family members sell their wares at Northern California area farmer’s markets and their products are on the shelves at Corti Bros., Taylor’s, Nugget Markets, Whole Foods and many other specialty shops. They’ve been raved up in Martha Stewart, California Heartland, in the Sacramento Bee, the Sacramento News & Review, the San Francisco Examiner and the Oakland Tribune. Bariani oils are processed using traditional Italian methods but are made from Mission and Manzanillo olives, both native to California. Some of the trees in their orchards date back 130 years, when they were planted by a Sicilian farmer on their first orchard, located in South Sacramento. The Sacramento orchard now serves as their nursery, and there is a larger orchard and processing facility located in Zamora, in nearby Yolo County. Though the family has been producing oil since 1991, I didn’t encounter it until 2003, when I was introduced to their oil at the unlikeliest place— my local pub. My husband and Sebastian, the youngest Bariani son, got to talking over the foosball table, and soon we were offered a tour of the Sacramento orchard, their little facility and their home. We met Bariani patriarch Angelo, at the Sacramento farmer’s markets. We sampled olive oils. We loved the vibrant and grassy, slightly bitter flavor their oils imparted to foods. We were hooked. 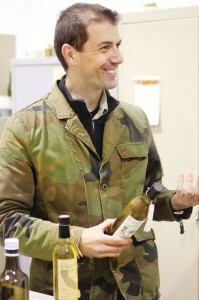 But it wasn’t until a recent trip to San Francisco that I learned about some of their forays into other products. While at the farmer’s market at the Ferry Building, Sebastian slipped my husband a little white pot of face and body cream for me. I was curious. I opened it. The cream is green and smells of…what else? Olive oil. I tried it. My skin glowed! I also learned that those Bariani boys were experimenting with olive pits! And olive paste! I had to get to the bottom of this. It wasn’t until I sat down with Sebastian over a pizza that I learned the extent of the family’s commitment to running a sustainable business. You’ve heard of nose-to-tail eating? The Bariani family is applying this principle to olives. There’s olive oil. There’s truffle-infused olive oil. Olive oil body and face cream. Olive oil soap. Lip balm. Shampoo. Other products in development include an olive oil body scrub and lightly herbal olive leaf tea. All of the face and body products are made with food grade olive oil. After all of the oil has been squeezed out of the olives, the leftover olive paste, which is highly acidic, is spread in the orchards, around the trees, where it acts as an herbicide. After a few months, the paste mellows out and becomes an excellent organic compound–rich in nutrients–which the olives absorb as fertilizer. Even the pits find a use. 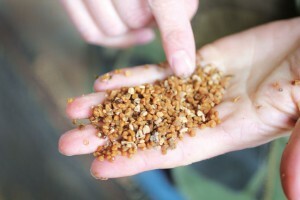 Currently, they are being fed into a furnace to heat their facility and provide hot water, and the family is experimenting with burning the olive pits for use in pellet stoves and smokers. The Bariani’s reduce/reuse/recycle philosophy extends to nearly every aspect of the business. For their orchards, they use a low-mist irrigation system to conserve water and they water at night to prevent loss of water to evaporation. They’ve heavily insulated their production facilities to prevent heat loss, and they use all energy-efficient lighting. During olive oil production, they reuse and recycle all of the water that they use in rinsing and washing olives. What can I say? I’m hooked. I’m sticking with Bariani. Excellent article! I have so much respect for the Bariani family and so much love for their oil. I bought my first bottle a little over 10 years ago and have purchased it as often as I can since. I struggled for a few years financially but was finally able to purchase several more bottles and received them today. Opened up a bottle of pure heaven within just a couple of hours 🙂 This is the olive oil I will always compare others to and I have tried many. I’m a nutritional hobbyist, a foodie and well, I simply have extremely selective taste 😉 I’m so glad they are expanding product offerings as well. I got two bars of soap and can’t wait to try the body cream at some point. I am a lifelong devotee of Bariani and I hope that I never have to go long without it again.